While we are nearly done with the book of Isaiah, we are hardly finished with all that the Scripture has to say about the Millennial Reign of the Messiah! And it seems that towards the end of this book, Isaiah’s intensity and frequency of mention of the Messiah increases, to the point where virtually every chapter and every verse references the King of Israel and His future kingdom there. Last time we covered chapter 61, but we hardly venture into the beginning of the next chapter when we are confronted with even more revelation! While I made the point already (a few times), redundancy is important in this regard: Zionism in its biblical form is not only legitimate, it is destiny as outlined in prophetic Scripture! We see it everywhere in the written Word; prominently in PSALM 2 – as well as other places, like ISAIAH 62. That being said, there are other forms of Zionism which are to various degrees legitimate, or not, depending on their basis. Certainly occult Zionism as promoted by Rothschilds and other interested parties that have invested considerable finances to the establishment of the modern government of Israel is counter to the absolute and perfect will of God. 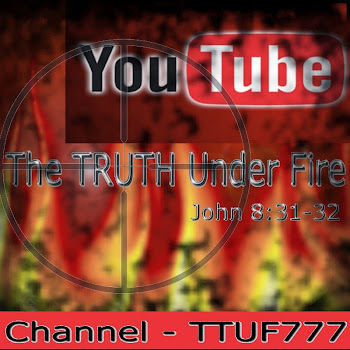 The fact that it was to a majority degree, the money of such men that helped to bring things together for Israel matters not to God – He even uses Satan for His purposes, how much more the evil men who serve the fallen one? Ultimately, we understand that God is sovereign and that He holds all things in His hand; just as He declared that He would bring Israel back “the second time” (ISAIAH 11:11), He has also promised to restore the kingdom of Israel – the pure doctrine of Zionism – under His own rule as the rightful King of Israel. Note that Zion is associated with Jerusalem, the city which is hardly recognized as the credible capital of the nation (most governments insist that it’s Tel Aviv, not Jerusalem that is the capital, due to political expediency and to curry favor from the oil-rich Muslim nations, which themselves have the determination to rob Jerusalem from the Jews and claim it for themselves, and bring utter ruin to Israel). Yet “Jerusalem: is mentioned 767 times in the Scripture; “Zion” is mentioned 153 times; “city of David” 62 times; “the Holy city” 26 times. To say that God has a high regard for that city and the land is an understatement of epic proportions! In the passage before us, the LORD declares that He will not hold His peace – for the sake of Jerusalem, He will not rest, until her righteousness is revealed in all the glory that God intends for her. All the Gentile nations will witness this “crown of glory in the hand of the LORD” – and they shall not be called “forsaken” or “desolate” because the LORD delights in Israel and the land that the nation dwells in. She will even be given a new name by the LORD – something that has yet to happen. Certainly in her history, Israel has had her allies; particularly ancient Israel, during the reign of David and even more so, the reign of Solomon, his son. However, the modern state of Israel is a far different story – even the United States, for all of the government’s lip service of friendship and stalwart alliance with the Jewish people, have worked actively behind the scenes (particularly the State Department*) in opposition to Israel, ever since their return in 1948. Yet in vs. 7 of our text, the LORD declares that He will establish this nation and “make Jerusalem a praise” – not among certain nations, but the entire Earth! This certainly is unprecedented! Especially since the 20th century when anti-Semitism has reached fever pitch, not just during WW II but even today! Yet the LORD’s Word shall stand fast: this shall take place just as the prophecy indicates; my assertion is that this will be realized when the King returns and is received by His people, the Jews, at the Millennium! Casting up the highway, gathering out the stones is a reference to maintaining or even refurbishing a roadway where a person of nobility will soon travel in order to visit his people. It’s the Scripture’s way of declaring the coming King to the nation. Again, the mention of Zion – the daughters of such – is addressed with the promise of salvation; to the holy people, the redeemed of the LORD. As with us, Israel possesses no holiness of their own, and cannot hope for redemption except in the Person of Jesus Christ; and yet this promise stands sure in the pages of Holy Scripture, the truth of God’s Word! Though they are now unredeemed, and bereft of holiness, the LORD will transform them – as He has done with us, according to His grace, and faithfulness to His promises. He shall seek them out, and Jerusalem shall not be forsaken of the LORD! As mentioned on countless other occasions, when we read prophecy, we often read it through an order that we are not accustomed to here in the Western world; we like things to flow chronologically in any narrative that we read; however, in Eastern literature, and especially in Hebrew writings and even more so prophetic Scripture, things are not always written in chronological order. We often read about events to take place during Daniel’s 70th week and then, immediately following, something that occurred during the time of the LORD Jesus’ earthly ministry. Likewise, in ISAIAH 62, we read many passages that deal with the MILLENNIUM; and here at the onset of ISAIAH 63, we are reading about the LORD in His Second Coming, at the conclusion of the 70th Week of Daniel. 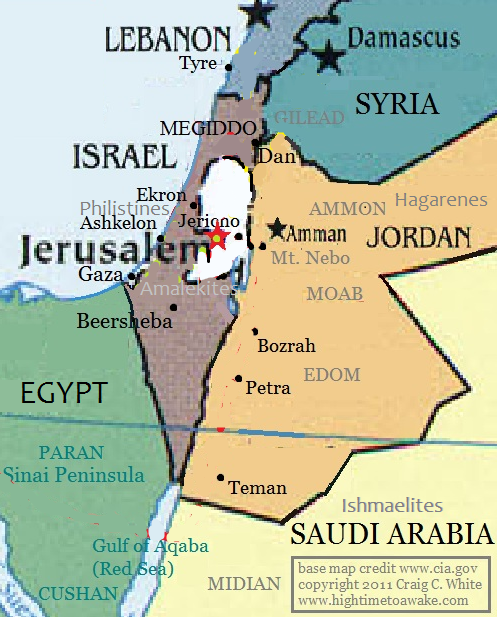 He comes from Edom, a region [here is a map of the region] that represents about the lower third of the nation of Jordan. His garments are dyed red (like those who trod grapes in a wine vat) because He has committed a great slaughter of those who were attacking His people, Israel. We read about this elsewhere (ISAIAH 34:5-7; REV 14:17-20; 19:11-21). The remnant of faithful Jews, who during the time of Jacob’s Trouble, will embrace Jesus as their Messiah, will be led by the Spirit to Bozrah, or also known as, Petra. We know that there is a distinction between the LORD’s First and Second Advent, being exclusive events, because of when the LORD Jesus read this very passage and stopped eight words into verse 2 (See LUKE 4:17-21). He did not go on and quote the remaining part of verse 2 and none of verse 3. We see the same editing, as it were, in ZECHARIAH 9:9-10 where it addresses the coming of Christ into Jerusalem (which we recognize as ‘Palm Sunday’). Just as prophecy indicates, He came riding into the city riding upon a donkey – but then in verse 10 Zechariah speaks of the dominion of the LORD “from sea to sea” and His speaking “peace to the Gentiles” – events that have not yet happened but will transpire in the Millennium. So within two or three verses we witness prophetic events that have already happened (at His First Advent), along with those that have yet to be fulfilled (At His Second). In fulfilled prophecy, we read about Christ coming with the message of the Gospel of peace, in seeking to bring reconciliation for sinners with our Holy God (which He has done and continues to do); in prophecy that has yet to be fulfilled, we read about Christ Who is coming as Judge, and Righteous Executioner (which He will do upon His Return). Two events: the same Person of Christ. Further demonstration of the duality found in the Person of Christ, not just in regards to a time differential, but in His role during these circumstances we shall witness upon His Second Advent; we observe both His goodness and His severity (as in ROM 11:22) towards the people of the Earth. We see Him bringing salvation to those who desire Him, and fury against those who spurn Him as the Righteous Ruler – He Who is Creator God and LORD. He will tread down in anger and fury as well as bestow “great goodness” towards the House of Israel, His loving kindnesses, His mercies. Being the awesome Savior that He is, and always has been, He identifies wholly with those He saves: their afflictions became His own, He bore them in accordance to His longsuffering, even though they rebelled many times; still He pitied and loved them. Merely being in His Presence is sufficient for those who love the LORD to know His salvation, and we saints shall experience this when we finally see our LORD face to Face, and we shall be fully redeemed, having our corrupted bodies transformed into incorruptible bodies, having the very sin nature that plagues our corruptible flesh eradicated from our being! See ROM 8:22-24; 1 COR 15:53-54; 1 JOHN 3:2. Whenever Israel disobeyed God, they were put in ‘the penalty box’, and the land cast them out, just as the Word of the LORD said would happen upon such disobedience (DEUT 29:22-28); yet because of the LORD’s oath to Abraham (HEB 6:13-18) He would not refrain from fulfilling these promises to the nation, but out of the abundance of His grace, and not due to their worthiness. He will not cancel His covenant promises to His people, Israel. Yet the LORD has not made any such covenant with any other nation in all the world – and while the Gentiles have usurped control over the nation of Israel (specifically Jerusalem; this period of time is known as “the times of the Gentiles” – see: LUKE 21:24) more than Israel herself has governed that land, there is coming the time of the Millennium, when all of God’s promises, both to Abraham and to David as well, will be fulfilled. There are many who try to ‘force-fit’ the covenants of Israel to apply to America – or even say that America has a covenant with God similar to that which the LORD made with Israel. 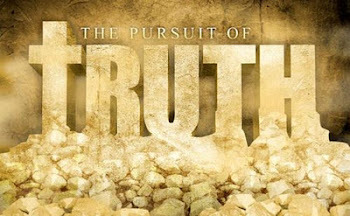 This is a fundamental premise to the book by Jonathan Cahn, The Harbinger* and it is a fundamentally flawed premise, because God made no covenant with us as a nation, and any covenant in the Scripture is always initiated by God to the people, never vice versa (which is Mr. Cahn’s claim – that the Pilgrim’s made a covenant with God). *- David James wrote the book: The Harbinger: Fact or Fiction and we have written a series of articles based prominently on this text. The LORD during the Millennium will reign over the Gentile nations, but as the Supreme Regent due to Israel finally being brought to the place of global leadership, and the LORD Jesus Christ as the Messiah King of Israel (JER 16:19-21; MATT 2:5-7; 12:20-21). Today, here in America and all other Gentile nations, we are blessed by the new covenant which was offered to Israel by the Messiah, but rejected – and so, for now, God offers this covenant in Christ to us (ROM 10:19-21; 11:11-13), but on an individual basis, not a national one – but will return to Israel the second time, and at that time (ZECH 12:10; 13:6), Israel as a nation will receive the covenant and the spiritual rebirth (EZEK 36:26). 18 But be ye glad and rejoice forever in that which I create: for, behold, I create Jerusalem a rejoicing, and her people a joy. Here, among the multitudinous verses that speaks of the Millennial Reign of Christ, is one of the more well-known passages. These verses are often taken allegorically by preterists and amillennialists, but as someone who believes in the grammatical-historical and literal view of Scripture, I take it just ‘as is’ in the Word of God. I believe when the Messiah arrives and is received by the remnant of Israel, there will be profound joy unparalleled to any other time in her history! I believe there will be no sorrow, no more tears, but perpetual peace and safety for the LORD’s chosen. I believe that the longevity of life will be greatly enhanced so that a “child” (the word used in vs. 20 means “young man, youth, lad, etc” will die (presumably by accident) being a hundred years’ old. The Jews at this time will build houses that they themselves will dwell in, and never again be dis-possessed of their land and properties (as they have for so long during their woeful history). I believe that even nature will be transformed so that the animal kingdom will know peace: the predatorial nature of carnivores will be changed to herbivores; lions and tigers and bears (oh my!) shall eat “straw” – there shall be no hurt, no destruction throughout the length and breadth of God’s Holy Kingdom (“mountain”). What a blessed time that will be, when the righteous saints of Israel will be resurrected – the likes of Abraham, Isaac and Jacob – and all the patriarchs, along with Samuel and Elijah and Elisha; Moses and Joshua, King David and Solomon and all the rest, along with the remnant of Israel that embraces their Messiah at His return. And we, the church, the Gentile bride of Christ joining our LORD for this insurmountably festive occasion lasting one thousand years, with a complete and utter absence of Satan’s presence and his entire realm of darkness and demon lords (REV 20:1-3)! It is at that time when our LORD, the Supreme Leader of the world, whose flawless character and purest, noblest and holiest heart is exclusive in the right to so reign over all! And so, we eagerly await His arrival for His church, so that, meeting Him in the air, we shall ever be with our precious LORD Jesus Christ and experience all of what we examined today, first hand in the glories of the Kingdom!